Earlier this week we saw how Google Maps is helping chart Toronto's forgotten laneways, paths and trails to make for a more comprehensive map of the city, potentially at the loss of a little mystery. Despite the current map being extremely detailed, it turns out there are still plenty of gaps. The image above shows Albert, Louisa and Alice as they appeared before both city halls or the Eaton Centre were built. 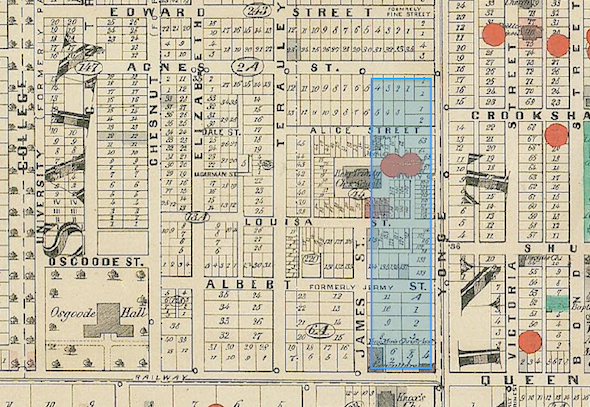 The blue highlighted area shows the footprint of the shopping centre today that partially severed or erased the streets from the map. Albert Street, still partially hanging on behind new city hall, was named for the husband of Queen Victoria, Albert of Saxe-Coburg-Gotha. His death from typhoid in 1861 had a profound effect on the monarch. 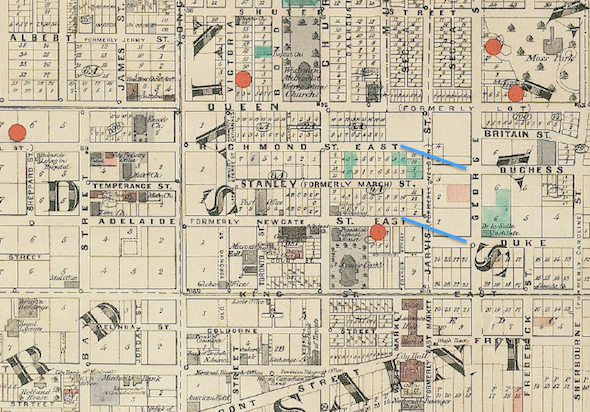 The block that includes Osgoode Hall, City Halls I and II, and several other buildings has been significantly altered over the years leaving only a few fragments of the original layout. The first incarnation of Bay Street, which was originally called Bear Street, ended at Queen. North of Queen several unconnected streets - Terauley, Saint Vincent and North - would eventually form the extension of Bay to Bloor, a fact still visible in the diagonal intersection at Queen and Bay. The blue line shows the current route of Bay north of Gerrard to Bloor. Terauley Street was named after Terauley Cottage, the home of John Simcoe Macaulay, an early political figure and godson of John Graves Simcoe, the first Lieutenant Governor of Upper Canada. The word is thought to be a portmanteau of Ter, a Gaelic word for land, and a slightly altered spelling of the latter part of Macaulay. Although we've hung on to King, Queen and Princess Streets there used to be more rank-based street names. Duke and Duchess Streets once ran parallel with the waterfront east from Jarvis Street before both were absorbed into other routes as part of the construction of the Don Valley Parkway: Duchess Street with Richmond and Duke with Adelaide. Like Bay and Queen, the diagonal intersections at Jarvis Street give away the fact two streets used to be four. The Duke and Duchess in question were the Duke and Duchess of York, most likely Prince George (later King George V) and his wife Mary of Teck or Prince Albert (later King George VI) and Elizabeth Bowes-Lyon. 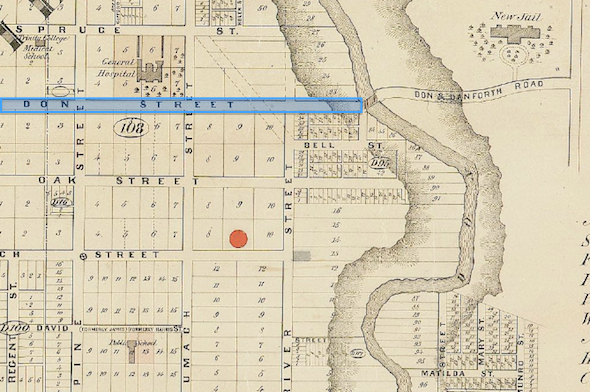 Dundas Street, a relative newcomer to the city, was formed by stitching together several distinctly separate streets. Major deviations at Bathurst and Yonge (forming Yonge-Dundas square) demonstrate the fact the streets didn't entirely line up. The roads listed above were renamed between Bathurst and the Don River to form Dundas. The list is even longer if you include the roads in the east end and west of Bathurst. 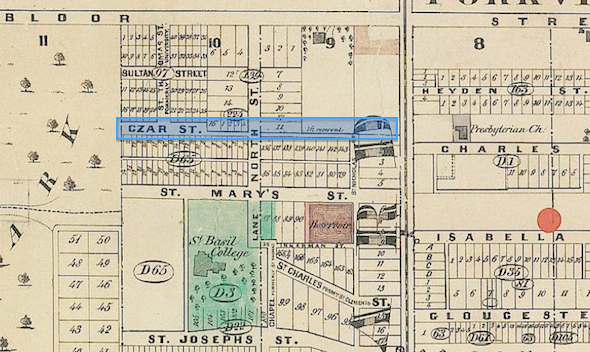 According to Liz Clayton in the National Post, Czar Street, located one block south of Bloor west of Bay, was named "in honour of the autocrat of all Russians" until it was absorbed into Charles Street. Czars were the emperors of Russia before the revolution 1917 that overthrew the monarchy. In a similar vein, Sultan Street to the north was presumably named in honour of Muslim sovereigns. The latter lives on today as a service road south of Bloor. South Park Street ran parallel with King up to its intersection with Queen and over the Don River. 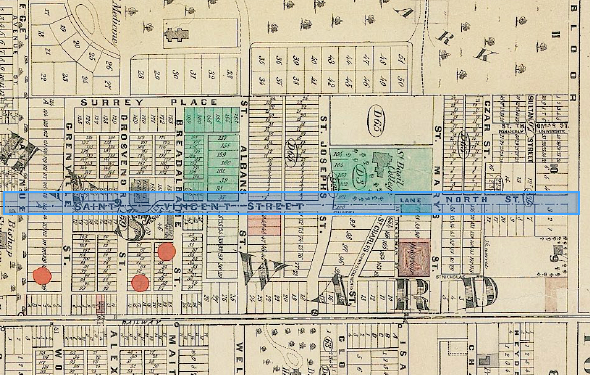 A North Park Street, now Sydenham Street, ran for a block north of Queen. 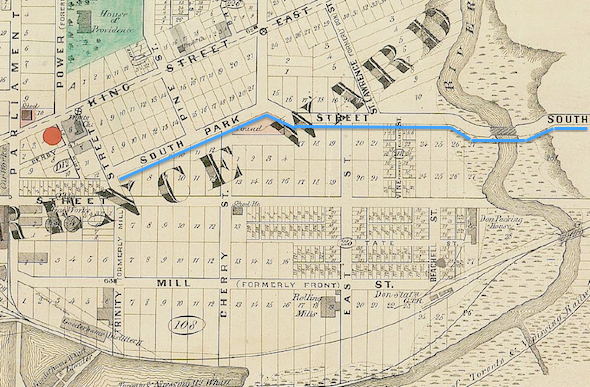 Perhaps named for King's Park, an open marsh on the banks of the once winding Don that was the centre of misplaced health concerns, South Park Street followed the approximate route of today's Eastern Avenue. Absorbed by Gerrard, another power hungry street in Toronto, Don Street once forded the Don River to reach an entirely different Danforth Road. As I mentioned in an earlier post, Danforth Avenue and Danforth Road are named for Asa Danforth Jr., an American builder and land speculator who laid out the first road east to Kingston. The mighty Don gets its current name from the ubiquitous John Graves Simcoe who named it after a minor river in South Yorkshire, England. The original Don is named for DĂÂ´n or Danu, a Celtic goddess. All images from Wadsworth and Unwin's Map of the City of Toronto, 1872.